Habitat for humanity is a global nonprofit organization whose vision is to create ‘A word where everyone has a decent place to live.’ On 30th June’16 persons from Habitat addressed the students on lending a helping hand in building homes for the needy. We believe these activities instill values of social contribution, compassion and generosity in school children. The presentation on Habitat showcased their objective being addressed by their brand Ambassador Mr. John Abraham. Habitat is a non government organization it builds homes and toilets for needy. “Never believe that a few caring people can’t change the world. For, indeed that’s all who ever have”. We are glad that we have sensitized our children to the needy, and we are proud that they have managed to collect Rs. 65,000/- for the Helpage India. Congratulations dear students and keep up the good work!! In today’s world people live in nuclear families and do not want to take the responsibilities of older people (grand parent). So these old and helpless people are shifted against their wish to stay at such places where they miss the love of their family members and SPECIALLY their grand children. To sensitize this very delicate issue the students of grade III and IV visited “Jeevan Sandhya” an old age home at Navrangpura. 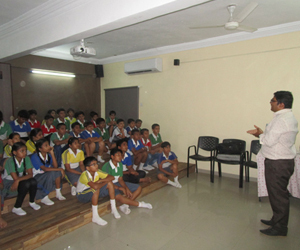 The students of Shiv Ashish planned to share a few memorable moments with them. They prepared a skit and few dance performances. At the end ‘Kuch Meetha Ho Jaye’ was done by the money which the children had contributed by sharing a kulfi with them. All the old people were happy and thankful to the smart kids of Shiv Ashish, but a little sad when it came to say Goodbye!